Extra large water jet for 50% more coverage than standard impulse heads. Three leg telescoping tripod reaches height of 58 inches for extra high coverage and even larger distances. Spiked feet for added stability. Patented impulse arm saves water by eliminating back and side splash. Long lasting metal head construction. Extra-large water jet for more coverage than standard pulsating heads. Water coverage up to 8500 sq. ft. Long lasting metal head construction. Three leg telescoping tripod for extra high coverage and even larger distances. Diffuser screw allows for easy f ingetip adjustment of water stream for even coverage. Sprinkler head has 3/4'' NPT connection to base. Spiked feed for added stability. Sprays up to 20 sq ft or the entire backyard- up to 1900 sq ft! 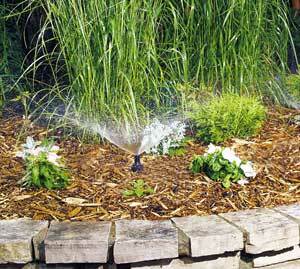 This is a cost effective and efficient way to water landscapes, border areas, and gardens. It is simple to set up, simple to adjust and simple to use. The spray patterns are adjustable from a one-foot to a 12 foot diameter. It comes with snap-on deflectors for a half-circle spray pattern. The small sprinkling devices are stuck into the ground and a feeder hose is easily connected. LR Nelson introduces a brand new way to water landscaping, flowers, border areas, and gardens. This all-in-one kit sets up in five minutes or less and includes: 50-feet of tubing, five spray nozzles, ten risers, five half-circle nozzle adapters, five tubing hold-down stakes, and eight goof plugs.